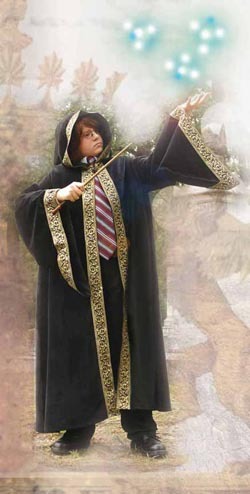 Which of your young wizard apprentices would not look imposing wearing this magnificent hooded robe? This heavy black cotton velvet garment is richly accented with a decorative gold trim and has a metal clasp for a secure closure. Looks enchanting with the hood either up or down. Dry clean. One size. 47 " long.